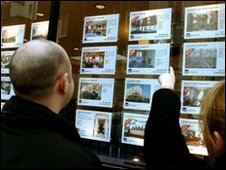 The number of mortgages that the UK's biggest banks agreed with home buyers "fell sharply" in January, the British Bankers' Association (BBA) has said. The BBA said many buyers had borrowed in December to beat the re-introduction of a lower stamp duty threshold. The BBA's members approved 35,000 new mortgages to home buyers last month, down from 46,000 in December. Meanwhile, figures from the UK tax authority showed that the number of UK home sales halved in January. The BBA figures showed that total mortgage lending fell to just £8bn in January, the lowest monthly amount for eight and a half years. Melanie Bien, Savills Private Finance. In addition to the stamp duty changes, the association also blamed the very cold weather for deterring would-be home buyers. "It was no surprise to see the January mortgage figures falling back from December, when transactions were being pushed through to beat the end of stamp duty relief," said the BBA's statistics director, David Dooks. "There was a natural reaction in the January figures and the bad weather further suppressed market activity," he added. The BBA's figures echo those published last week by the Council of Mortgage Lenders (CML). The CML also said the rush to buy homes before the government's temporary stamp duty holiday ended had prompted a big drop in mortgage lending last month. Melanie Bien, of Savills Private Finance, said: "There has been a big hangover from the stamp duty holiday." And she added: "The very poor weather conditions meant everything ground to a halt." But she said that the housing market was now about to enter a busier time of the year. Separate figures from HM Revenue and Customs (HMRC) showed that the number of homes sold in the UK in January more than halved compared with December. Some 51,000 transactions on properties valued at £40,000 or more were completed in January. This was sharply down on the 104,000 transactions completed in December, and the lowest since February 2009. With house prices recovering slightly over the past year, one of the bigger building societies has launched a new range of mortgages aimed at first-time buyers. The Newcastle building society is offering loans requiring just 10% deposits, with interest at 4.6% for its two-year tracker mortgage and 5.95% for its two-year fixed rate deal. However, the Newcastle warned that the funds available for these deals were limited. Ray Boulger, of the mortgage lenders John Charcol, said: "Both deals are certainly pretty competitive."